When we were kids the moral lesson most of us learned was that we were supposed to tell the truth. If we didn’t we got in trouble with our parents who expected nothing less than full honest disclosure from us. When children grow up the lines between truth telling, white lies and full-fledged deceit become blurred. Some become deceitful for personal gain while others do it to avoid conflict or hurt feelings. Some go so far as to say that lying is a good thing at times. Some politicians take pride in being good liars. So then, how important is it for the seeker after soul contact to tell the truth? The answer is that it is of extreme importance. How can one expect to see the truth in the world of the soul if our fellow travelers cannot see the truth in us? If we are a source of deception to our friends then the soul will be a source of deception toward us. How can this be? Isn’t the soul, or Higher Self, always a source of truth? Yes, truth comes from the soul, but it must be filtered down through your mind and emotions. If the mind and emotions are corrupted by deceit then the truth from the soul will become corrupted as it filters down through them until it comes to your consciousness. Even the purest words will be corrupted by the darkness of deceit. The deceitful person with a corrupted mental and emotional atmosphere will not only distort attempted communications of the soul, but all words. Such a person can read the words of Jesus in the Bible and see them through a filter that robs them of their light and truth. The same may encounter an honest person doing his best and see him as an enemy that needs put in his place. It is of extreme important that the seeker of truth be the truth by making sure that all his words are true. Would we expect God, Christ, angels or messengers of God to lie to us? Then we must gain that same trust from our associates. Those in relationship with us must come to believe that we are telling the truth to the best of our ability. Assignment: review your life and assess how often you have told lies or deceived. Now ask yourself what you can do for the remainder of your life to avoid these mistakes of the past from repeating themselves. There are many reasons given to justify some lies. Some are reasonable and some are not. Indeed, there are a number of situations where almost everyone would lie. Let us suppose that you lived in Nazi Germany and the SS troops came knocking at your door looking for your child to arrest him. To save his or her life any parent with a heart would indeed lie to misdirect them. Then on another level many lie to avoid hurt feelings. The mate knows he is in trouble when his wife asks him if she is too fat. The problem with lying, even when it seems justified is that it never produces an increase of light. If the disciple wants to maintain a clear channel to the soul and higher realms he must always tell the truth. Does this mean that the parents should have revealed to the Nazis where their child was? No. In an extreme situation like this, one would have to weigh the negative results of a lie against a possible murder. In this case the least harmful is the lie. Because no win situations do come up then wouldn’t total honestly be an unrealistic goal? Total honestly may be more realistic than you think. The first thing the seeker must assess on the path to honesty is his own limitations. We all have a point, which, if reached, we would lie. The example of saving the life of a child would far exceed that limit for most everyone with a pulse. The seeker must look ahead to all possible situations that he may face and see where his line of limitation may lie. When the limitations are found, which, if crossed, you would lie then what must be done is to arrange your life in such a way that these lines of limitation are never reached. If you are not tempted more than you can bear then you will never have to lie. Einstein was smart enough to get out of Germany before the holocaust so he did not have to participate in the deception that would have followed. There is always a way of escape, but many do not find that way because they do not look for it. The key is to look in advance. Now as Alan rehearses in his imagination possible answers he is doing what the seeker must do to follow the path of honesty. Alan’s Wife: Do you think I’m too fat? Alan: What makes you ask that question? Wife; I was already too heavy and the scale says I gained five pounds this week. Wife: Very funny, but don’t you think I’m looking like the Goodyear Blimp? Alan: Now, who’s being funny? Look, I didn’t marry you for your weight, but for you and I’ll love you no matter what. What weight do you need to reach to feel comfortable with yourself? Wife: I think I need to loose about 20 pounds. Alan: Well, let us work up a plan then and maybe change some of the things we eat. I’ll even eat more salad with you if that helps. Alan’s approach may not be perfect, but he did not have to lie and he stayed out of trouble. The seeker should have faith that the scripture is true, that he can find a way of escaping the temptation to lie, but he must use all his resources and look ahead and plan his moves. Life is a bit like a game of chess and you are not going to win without planning. Assignment: Think ahead to events that may befall you in the coming months and try and see situations where you may be tempted to lie. When you see these possible situations then look for the way of escape that is promised. A common misunderstand of honesty is that you have to tell all you know. This is not a requirement. If it were then none of us who wanted to be honest would ever stop talking because we all know much more than we say. Total honesty, the type that provides a channel for unhindered soul contact requires that all the words you speak be true, but not that you reveal all you know or that is on your mind. Like God we are all entitled to our private thoughts and to conceal whatever we think is appropriate. Let us say you have a valuable recipe that you want to keep to yourself and a friend asks you for it. If you tell him that you are not revealing it then you are not being deceptive by withholding information, but honest in your statement. Maybe you could give him a hint by giving out several, but not all ingredients. Again you are telling the truth, yet concealing things. A mistake made by some critics of telling the truth is that one sometimes must be rude if he is honest. There are pleasant ways to say the truth, even inconvenient truths and then there are rude ways. One can almost always find a non offensive way to tell the truth. Telling an overweight person he is fat is rude and unnecessary. One may be reminded of the Seinfeld episode of the ugly baby. The group went to see a couple’s new baby and were aghast at how ugly it was. The producers wisely never showed the viewers the baby and left it up to our imagination. Jerry and friends lied and said it was gorgeous while being sickened just looking at it. The way out in a situation like this is to find something positive you can truthfully acknowledge such as a good feature on the baby, or maybe its nice cloths or its room. If you tell parents their baby is ugly you are going to be in for a lot of trouble. 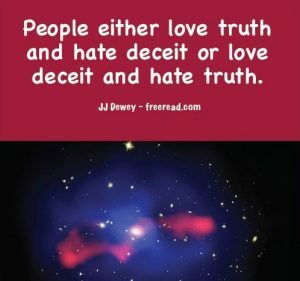 Many teachers have overlooked simple honesty as a basic principle for soul contact as this is something taught to children in Sunday School and it seems to be more engaging to talk of more exalted subjects. The problem is that the simple truth must be mastered before the complex ones can be used effectively. The principle behind honesty is this. We reap as we sow. If we want the truth revealed to us then that which we reveal to others must be true. He who deceives others will be deceived and he who enlightens others with light and truth will receive the same. Assignment: Make a commitment to be a vessel of truth so all the words you speak will be true. One of the problems with the truth or any inspired idea built upon truth is corruption. No sooner is truth spoken, than many who hear it will alter it, thinking they are doing the world a favor, but instead making impure that which was once pure. The seeker of true soul contact must learn to look through the eyes of the soul and distinguish between that which is corrupt and that which has true principles as its foundation. Unfortunately, corruption is the natural order of things in this world where illusion dominates. Here is how it often works. An inspired individual or group taps into the plane of divine ideas and formulates a plan to materialize here on the physical plane with the idea of being great service to humanity. The idea begins to take hold and many see its benefits and come on board to participate. Then the founder dies or is replaced and a new generation takes over. The new guy or guys want to put their mark on the plan and come up with their own ideas and incorporate them thinking they are making improvements and will receive praise for their intelligent input. The trouble is that over nine times out of ten the new leaders do not see the vision of the founders and the changes they make are in the direction away from divine ideas, not closer to them. The original inspiration that founded the idea is usually lost or very corrupted after three or four generations of leadership. If the founders were to be born again after the sixth generation they would be seen as heretics to be driven out, not as heroes as depicted in their statues that adorn the headquarters. Indeed, if Jesus had shown up incognito after Christianity became established they would have burned him at the stake, all the time thinking they are doing the will of God. The game of Chinese Whispers illustrates this principle. You gather eight to twelve people in a circle and one person concocts a phrase, like, “the cow jumped over the moon,” and whispers it in the ear of the person on the right. Next that person whispers what he heard to the person on his right. This keeps going until the last person receives the message. This person then states what he heard. When I have played it the last guy says something senseless so far away from the original that the group laughs at the irony. Unfortunately most real corruption is not funny and has been the cause of much terror and persecution that has happened in the history of our planet. Fortunately many are starting to wake up to the corruption going on in their midst and are seeking for true principles to be governed by. Assignment: Find three divine ideas that enlightened people tried to initiate and follow them through the years until the corruption set in and hindered their manifestation. The eyes of the Higher Self see pain as a guide, whereas the lower self sees it as an obstacle that merely needs to be eliminated. Of course, the Higher Self does not suffer physical and emotional pain as do us mortals, but it is aware of pain that faces us and sometimes arranges for that pain to occur in order to guide us in a positive direction. Most pain is caused by resistance to the spiritual energies of the soul attempting to guide us toward liberation. The exception to this may be some accidents, some problems related to old age and some things related to karma. Most major accidents that cause life problems are not totally accidental but arranged to teach us certain lessons. Even in old age many problems that bring pain are there to teach us to not resist the spiritual flow of the soul. Then too, when pain comes because of karma there is still a lesson to be learned and once learned the pain can often be eliminated or drastically reduced. When the stubborn person goes through much pain to the extent he becomes frustrated and looks to the skies and shouts out, “Why, God?? ?” he has then reached a point of tension which is also a point of opportunity. That opportunity comes in listening for the answer. If the person does not expect or try to listen for the answer then the opportunity to eliminate the pain is lost. We are told that approximately one hundred million people in the United States suffer from chronic physical pain. That is about a third of the people and most of them take dangerous habit forming drugs like Oxycontin for relief, which takes their attention away from looking for the real source of the pain. In addition to that, most of the other two thirds have suffered significant pain one time or another in their lives. But, in addition to bodily pain we are also faced with emotional pain which is often worse than the physical. A lost love or relationship problem is probably the largest cause of emotional pain. Then there are others such as the failure of an endeavor, rejection from peers, lack of recognition or job satisfaction, guilty conscience and others. Overall, there is plenty of pain to go around for everyone and we have all complained at one time or another. It tells us that most people are not listening to the inner voice, which can guide us away from pain to the way of peace, physically, emotionally and mentally. Assignment: Assess your own pain, past and present. Have you had pain in the past that has gone away? Was there a lesson learned? What was it. Do you suffer any pain now either physically or emotionally? What lesson is there that you are supposed to learn? Once the seeker accepts that the true cause of pain may hold a lesson for him the next step is to discover what that lesson is. Once discovered the seeker can then make a correction and negate the cause of pain and the tread the path of healing. Resistance to soul energy causes most pain. In other words, the soul has sent a message and the seeker is ignoring it. Therefore, the only recourse for the soul to be heard is through pain. As soon as the seeker begins to suffer pain, distress or illness he snaps to attention. Unfortunately, instead of asking what is the spiritual cause he will enquire about a physical one and seek only physical remedies. (1) Fist realize that there may be a message behind the pain, distress or disease. (2) This message involves something you should be doing, but are not. (3) Ask your soul directly what it is you need to do or learn to negate the cause of the pain. You can do this by praying to God to send you a message through the soul or to meditate on the answer. (4) Examine your life, especially the past ten years. Before the soul will send you a message through pain it will try other methods. Before the pain you probably had inner feelings of what you needed to do, perhaps even messages in dreams, but you ignored them. You may have also had circumstances come up several times to push you in a certain direction, but ignored the signs. Now, if the last resort of pain is used by the soul one must examine the past and look for clues that may reveal the message it is sending. Contemplate these questions in preparation for the next lesson. Disease is either centered on congestion or inflammation. What is the clue in each? What are the clues if the disease is centered around the heart, or the throat, the solar plexus, or the head? The type of disease and its location is just not a matter of chance, but contains a symbolic message. The world as a whole has a strange approach to disease and pain. The common idea is basically this. Diet, exercise and attitude contribute to health but only a certain amount. Most disease is just due to bad luck, beyond which there is nothing we can do. The idea that pain may be a sign that there is a lesson to learn which is being ignored would seem ridiculous to many. Many think it is just outrageous to think that pain is a sign that some behavior correction is in order. On the other hand, how logical is it to believe that most pain and disease are just the result of bad luck? This idea completely negates the idea of justice in life or fairness meted out by God. If we reap as we sow and if there is fairness in life then every happening has a reason behind it and control is assumed when that reason is found. Does this mean that some poor soul who is suffering with a crippling disease deserves to be lectured to and told that his problems are all his own fault? Of course not. That would be cruel and it is not our job to offer what may be construed as critical remarks when the person is already suffering. The solution is between the one suffering and his own soul. If he seeks your help and you feel impressed from within to give it that is well and good. If he does not ask then do not go into the spiritual causes unless impressed to do so from your own soul. Cancer would be an example of a disease of congestion and a rash would be one of inflammation. Heart problems are connected with the development of correct use of love which come from the heart. There are numerous levels of understanding related to love, and when the seekers next step in this area is ignored then he may have heart problems as a signal that he needs to increase the quality of love he is giving out. The throat is the creative center and a problem in that area is a sign that the person needs to have more creative expression in his life. The solar plexus is the seat of emotions and a problem in that area is a sign of some emotional problem that needs correction. The head is where thought and ideas come from and a problem there often signals that the person is a dreamer who does not materialize his ideas and dreams. Problems with the legs or feet. Also consider this question: Does an understanding of spiritual causes of disease eliminate the need for other methods of treatment? It is interesting that the symbolic meaning of many things are already embedded in the consciousness of humanity and used by many of the rank and file. Basically, the mind of humanity understands that there is symbolism in all physical things and subconsciously incorporates it into everyday speech. Let us look further at those four problems. (1) A headache. Headaches can be caused by physical problems such as an accident or diet, but if there is no obvious reason for one that keeps reoccurring then a non-physical cause is probably at play. There are numerous areas of wrong thinking that can contribute to headaches, On an emotional level excessive worry and stress can have an effect. On a mental level confusion and lack of clarity in thinking can aggravate the problem. Soul contact will pull the seeker above the fog of muddled thinking and allow him to see with much greater clarity. When this happens the life force is enhanced, overall health is enhanced and headaches tend to disappear. (3) Back pain. Back pain that doesn’t seem to have an apparent physical cause indicates that the person is not standing up for himself. Perhaps he lets others walk over, or bully him into submission. Or it could relate just to himself. Perhaps he has set goals for himself and just has not gathered enough “backbone,” or will, to achieve them. (4) Problems with the legs or feet. The legs and feet allow us to stand, walk and run and be physically independent, Problems there are thus related to independence and not following the highest one knows. We need to “get a leg up” and motivate ourselves so we can stand “on our own two feet.” Doing this will help us to have good health in the legs and feet. No it does not. Often the cause of pain and disease is a combination of physical and spiritual problems. And even if it is mostly spiritual often there are physical treatments that can aid in healing. If a person is suffering he should try any treatment that seems to have a good chance at success. Some cures given by orthodox medicine are worse than the disease. The seeker needs to be wary of them. Assignment: Cancer is a dreaded disease that is the cause of much distress and pain to millions. It was already mentioned that it is a disease of congestion. Contemplate on what it is that is being held in that could cause such a thing. Have you noticed that most people who have cancer are very nice people? Why would this be the case? One of the many advantages of soul contact is the seeker will attain a much greater ability to recognize truth. Often he will see the underlying principle that supports that truth. When faced with a belief in either Higher Intelligence we call God or nothingness he will marvel at creation and see that there is a guiding hand at play. When faced with a choice to believe in life after death he will feel the vibration of his own soul and knows he will survive death of the physical body. When he looks at the world of causes related to health he will internally register that much more than physical chemistry is at play. Even the hardened atheist senses that the mind, emotions and attitude has some effect on health, but one with soul contact will see more. He will see a connection between spirit and body – that many invisible forces are at play including an intelligent guiding hand that teaches us lessons through the pains that we suffer. The one without soul contact will lean on the accepted medical authorities and follow their instructions even if it kills him. The one with soul contact will sense when authoritative advice should be questioned and will find much value in alternative methods. He will be able to see the difference between charlatans in the alternative world and the real thing. Cancer is an interesting disease in that it is an obvious disease of congestion. Yes, there are physical ingredients that may stimulate the disease, but the tipping point is often caused by suppressed emotions. Suppressed anger, rage, guilt or hurt feelings can later manifest as a malignant growth. People who get cancer are usually seen as very nice people because many of them have suppressed negative feelings. There are times when giving the other guy a piece of your mind is a good thing as it frees the person from an emotional build up. Negative emotional build up not only increases the risk of cancer but it blocks life-giving energy and can cause other problems. It is therefore of extreme importance that the seeker release himself from suppression. When you feel an emotion within you that you are tempted to ignore or suppress what should you do? What if it will offend others by bringing it out in the open? What if it makes you look petty or unenlightened? Should you do it anyway? The answer here is yes; find a way to release the negative emotion even at the risk of causing disturbance. Let us suppose that someone makes you so angry that you feel like harming them. What should you do? Here are three different lines of approach. (1) You can take physical retribution and actually try and strangle the guy. Now after you do this you may feel great for about five minutes, but this is not a wise path for as soon as your rage expires you will suffer a lifetime of regret, remorse and possible punishment by the authorities. (2) You can do nothing, but hold the feeling in and hope it goes away. Whereas you hurt another person with number one you hurt yourself with this approach. This approach redirects the attack away from the offending person to you and the negative energy then attacks your own body as well as dams up your healing soul energy. The person with suppressed negativity may wind up suffering much more than the guy who was strangled. (3) You release the negative energy by communicating the feeling to the offending person. Suppose Lynn offends you so much that you feel like strangling him. You rule out number one because you do not want to hurt him and you rule out number two because you do not want to hurt yourself. What then do you do? The answer is that you resort to pure honesty and communicate how you feel. It doesn’t matter if the insult seemed huge or trivial, small or great, intentional or not intentional. The only thing that matters is that you hurt and you need to communicate it so it can be released. So how do you do this? Quite simply you tell Lynn in a pleasant way that you wish to talk to him and in as harmless a manner as possible say something like this. Now after this communication a strange thing will happen. The negative package of energy that was in you is now released and is sent to the person who caused the offense. When this occurs one of two things will happen. (1) The offender, Lynn in this case, will feel bad he hurt your feelings and attempt to understand and make things right. If he does this, the light of the soul comes into the relationship and dispels the negative energy forever, no more to return. (2) He takes no responsibility for your negative feeling or your pain. In this case the negative energy remains. You are now free from it because you released it through communication, but Lynn now has to deal with it. Because the negative energy remains in Lynn’s aura he begins to release it in some way, usually by lashing out or attacking you. If he does lash out at you, you must not return fire no matter how hurtful the words are. If you do, the negative energy will return to you. Instead show only love, compassion and understanding. If you do, the offender is likely to come to his senses and show love in return, which will dissipate the energy. If he is so hardened to resist your love he will then keep the negativity to himself because he inwardly believes he deserves it, but at least you are free. Do not be deceived into not communicating because the cause of the hurt seems like such a small thing or trivial. Your emotional body is not subject to logic and it matters not if the cause is significant or not. Do not be deceived into thinking that you will not communicate because you may hurt someone’s feelings. If you do not communicate, you will hurt yourself and your relationships anyway. Unless there is complete forgiveness on all sides there is going to be some hurt to deal with and there will be no way around it, so you might a well start the process of neutralizing it. Assignment: Assess your own emotional state. Is your energy low because you have suppressed feelings? Have you successfully let them out in the past while at other times you did not? Is there anyone living with whom you need to clear the air? Good health is a tremendous asset for the seeker. Without it he is hindered in his quest to be of service to humanity, and, worse yet, he may be a burden on those around him. Instead of being a servant, he finds it necessary to be served. This is one of many reasons to seek soul contact as it will guide the seeker in the direction of health, vitality, peace and happiness. Most of us have had health problems or suffered through pain at one time or another in life. Fortunately for many, these situations have been temporary but others have had long term problems. As stated earlier one of the solutions is to tune into the soul to discover the lesson that is being attempted to be communicated through the disease. Often a change of behavior or thinking will bring healing. We must not overlook the fact that exercise and good diet are part of the ingredients for good health. In fact sometimes the lesson the soul is trying to teach may be connected to these two things. Sometimes a lesson that is needed at a certain point is the discovery of what foods are good for you and which are not or possibly the type of exercise you need. Not only is it important to understand the various spiritual links to health but the seeker must also understand orthodox common sense linked to it. One thing that is very helpful is to listen to your body. Your body is a living instrument and tries to give you subtle communication of what it wants and needs. The trouble is that very few tune into it until pain arrives and then they are forced to pay attention. Unfortunately, they notice the pain but many do not seek the reason behind the pain and instead only seek its suppression. The assignment today is to practice tuning into your body and how it feels about how you are treating it. Each time you eat a particular food mentally ask your body how it likes it. This has nothing to do with taste, as some things that taste pleasant are not what your body needs. Then do the same thing with drink. Is your body happy with the water you are drinking? Maybe it is too polluted. Then ask it about other liquids. Are you drinking too much or too little of various beverages? Do you take food supplements or vitamins? Ask your body about them as you swallow them. Finally, ask your body if it needs any food or drink that you are not presently consuming. After you ask the various questions sit back in silence for a few moments and listen for the answers. Next take this same approach with exercising. Are you getting enough or too much? Are you getting the right kind? Remember that energy follows thought and when this principle is applied results will follow. So, did you attempt the last exercise and tune into your body? Hopefully you sensed a few things. Some may say they tried but were not sure if they received anything definite. Fortunately, there are other ways to check with your body that do not require and extra sensory perception. A popular method is through muscle testing. There are a number of ways to do this but the basic principle behind them all is that your body knows what it needs and can signal you with a yes or no. Therefore, you need to devise a means whereby your body can communicate a yes or no to you. A popular method involves two people. Have a partner ready with all the questions you want to ask your body. Hold out your right arm straight ahead and try to hold it in place. Your partner then asks you a question and pushes down on your arm at the hand. As he does this you try and hold the arm in place. If you are able to hold your arm firmly in place then your body is signaling yes. If your arm weakens and can be easily pushed down it is signaling no. You can tell by the strength or weakness in your arm how much your body leans to the yes or no. If you want to test yourself for how much your body will benefit from certain foods or pills then place a sample in your hand, hold out your arm and have your partner test you. If your arm becomes weak then this tells you that your body doesn’t like that particular item. If it remains strong then this is a sign it benefits from it. A simple way to test yourself without the need for a partner is through the use of a pendulum. Fortunately, you do not need to buy one but can make do with a needle and thread. Get a reasonable sized sewing needle and thread it. Leave the thread about 18 inches long. Then hold the thread between your thumb and finger with the needle dangling below. Tell your body that if the needle goes in a circular motion to the right the answer is yes and if it swings to the left the answer is no. Next ask your body any question you want. After you ask the question hold on to the thread and attempt to keep the needle still. After a few seconds it will not stay still but will give you an answer by circling to the left or the right. Keep in mind that sometimes you may have to ask a number of yes or no questions to get what you want, but by being creative you can get any answer you want. Assignment: Use the pendulum method and discover three things about your body’s needs. The seeker may wonder how it is that your body can give you these answers through muscle testing or a pendulum and how accurate they are. Also one may wonder if they come from the soul. These answers do not come from the soul, but from the subconscious mind. The subconscious that can be accessed with these methods is like a supercomputer with lots of data and intelligent programming that can give you some pretty interesting answers. It is not flawless but often is quite accurate. If the seeker will keep his skeptical mind out of the way then the messages concerning the body can be quite accurate. That said one can use the pendulum or needle and thread method to ask questions on many other subjects besides the body. It is not as accurate in areas that one would consider psychism but it is fun to experiment with a variety of questions to see what answers you receive. Let us say that you misplaced your keys. Now the chances are that there is some record in your brain about where they are that can be accessed. If someone else misplaced then then your brain would have no such record. Are the keys in the house? If yes ask: Are they in one of the bedrooms? If no ask: Are they in a bathroom? If yes ask: Are they in the master bathroom? This should give you the idea. You keep asking until you get the location. Sometimes it works and sometimes it doesn’t, depending on the user’s sensitivity and whether or not the subconscious has the answer. Will I find love during the next year? Will I get a raise? Assignment: Go ahead and have a good time asking whatever comes to mind, but afterwards sit back, tune into your soul and ask it what was true and what was not. Take note of any impressions you receive. We have been talking about using questions with yes or no answers to access information contained in the subconscious mind. Now the question is – can this principle be extended to access the soul itself? The answer is yes, but the soul works through the conscious mind rather than the subconscious. Therefore, the method must change and approach must be to the consciousness rather than unconsciousness. Approaching the soul with yes or no questions is pretty simple. All you have to do is sit back, relax, close your eyes and ask yourself questions while imagining that the soul is listening in and will give you back yes or no answers. Most likely you will not hear the actual words but instead will receive a positive feeling for yes and a negative feeling for no. The type of feeling and the intensity will vary for each person. And how will the seeker know he is receiving the answers from the soul instead of his astral/emotional self? If the person has never contacted the soul he will not know for sure. If he has he can recognize the vibration and know with a surety as long as the impulse was strong enough to positively register. Okay, let us get started. First ask a couple questions to which you are sure the Higher Self would give a yes. Go ahead and visualize your Higher Self as you did in previous lessons and call on Its name if desired. There may be a lot of wrong-headed ideas of God out there but all spiritual students recognize that some type of Divine Intelligence exists. The reason for asking this question is you already know the answer through your soul will be yes. Therefore, it will be advantageous to focus on how the yes must feel when it comes from your soul. Again the seeker will know the answer has to be yes and he must sense what that yes feels like coming from the soul. If you have been successful you will now have an idea of what a yes answer feels like which comes from the soul. A no answer will be a negative feeling in the opposite direction. Your assignment today is to proceed to other questions to which you may want to know the answer. Am I fulfilling my life’s purpose? Is my thinking in alignment with my soul? If not, am I close? Is there something big I am neglecting in my life? Are the teachings of ____ reliable? Remember that sometimes to get the real answer you want may require a number of yes or no questions. Links for the first 15 sections of this series. I was thinking about what to talk tonight to you people and we may open it up to some questions at the end, but the thought that came to me is this:– There is reality as it really is and then there is what we perceive to be reality – two entirely different things. In other words, people have in their mind their certain beliefs and these beliefs are usually based on what they want to be true. So what a person wants to be true is often quite different than what is true. Visualize these as two paths; one the path of what you want to be true and the other the path of what is really true. Sooner or later the twain shall meet. And when they meet you have what is called the rude awakening. Has anyone here had a rude awakening before? Right, I’ve told this story several times about how I first heard myself singing on a tape recorder and I was rudely awakened to the fact that I didn’t have a professional sounding singing voice, and I was not going to be the rock star that I thought I might be. When I was a kid a tape recorder was rare, and my dad had to go borrow one from a friend. That was really a rude awakening for me. It was a good lesson for me because it kinda kept me aware for the rest of my life thinking, you know this reality of what I perceive to be reality may be different than what is reality. And so this is an important point: What we believe to be true is often just what we want to be true. Have you found that to be true? What we believe to be true is often what we want to be true. What we want to be true often turns into what we believe to be true. But what really is always true and can create a rude awakening. But then when we are awakened what happens? How is our perception of the truth changed, after the awakening occurs? Do we begin to like the truth? I’ll bet Blaine would be a good one to ask on this. You’ve had quite a journey through your life. Through your life Blaine, once you perceived something – found out that something was true – that maybe when you were younger you didn’t think it was true, but once you finally embraced the truth was it something you started to like after you embraced it? JJ: Yeah, you don’t like it when you find out certain things. This often happens even in calamities, Maybe you‘re in love with a certain woman and the woman breaks it off with you and you’re heartbroken. You thought she loved you but she says “I never really loved you – you’ve been like a brother” – you know – that type of thing. You’re just really upset, you’re devastated but then a little bit later you meet somebody twice as good, twice as compatible. Then on reflection 10 years later after you’re happily married you might be thinking man sure glad I didn’t marry that first one, she was totally wrong for me. So that rude awakening you had that she didn’t really like you that much you were like a brother was really good on hindsight, once you see the whole picture. And this is the way it is –truth – there’s a scripture that says: “truth cuts the wicked to the core”. It’s an interesting scripture. It cuts to the core people that are not prepared for the truth, because we have our mindset as to what should be true and the mindset goes along with our desires. And what produces pain? Pain is produced by frustrated desire. Buddha taught that in order to avoid pain, in order to free ourselves from pain is to free ourselves from attachment to desire. He says if we can do this then we can free ourselves from pain. And nothing produces pain more than having a desire for something to be true and then having that desire shattered. It’s interesting that Blaine and several here mentioned early Mormon connections and several of us were Mormons as one time and Joseph Smith made those interesting remarks about beliefs and truth. As you know in the early Mormon Church they went through a lot of persecutions. They were persecuted from city to city. The leaders were tarred and feathered, Joseph Smith and the leadership of the church were put in jail. Joseph Smith was kidnapped. Many of the leaders had their children killed and raped, and their wives raped. They went through all kinds of things and no matter what they went through it didn’t seem to phase them. That’s interesting, they go through all these persecutions, their wives are raped their children killed, they are drug through the streets and they just get stronger and stronger and they said, “We are going to take what God dishes out.” Then Joseph presents them with an interesting truth – like he presented the idea that man and god are one, that man can actually become as god is – and that shattered a lot of people like glass. It really, really upset a lot of people because it was so contrary to what they had been taught. It’s very close to what the new age philosophy and the ancient wisdom teaches. He began to teach about god and man – that man was more than just a man. But man was a god in embryo. The saints went through all this persecution; all this pain; and they stand no matter what happens no matter how much you shove them around. But present them just one thing contrary to what they want to believe and they will shatter like glass. And people haven’t changed that much have we? People will still shatter like glass when their mindset is challenged. It’s interesting in the last political election people were divided in two camps and one camp believes very strongly in their beliefs and on the other camp they believe very strongly on theirs. And of course out of these two camps one of them had to win, It’s interesting the nation was so polarized between the Democrats and Republicans that when there was a winner the losing side suffered a lot of pain. Many democrats had to take counseling to ease their pain over the election of George Bush. I’ve heard on different talk shows how they had a lot of psychologists giving out free treatments to people and then there’s another story about a guy who went to the white house made an announcement – and shot himself – and another guy who went to the empire state building and jumped off. But this – the last election was so polarized that whoever was going to lose it was going to be really, really upset, because both sides in the political system today are very attached to their belief system. Both sides are, and of course both sides have flaws in their belief system and if you are in a room with either side talking about their belief system and you point out one of the flaws in it, you’ll find that they will shatter like glass, they will think you’re the enemy. I’ll just give you an example on both sides. And some people here may shatter like glass because I’m going to give you an example on both sides. Let’s talk about the abortion side. Lets suppose you’re talking to a bunch of conservatives and they all voted for Bush and they’re all gung ho about the conservative cause and you mention “Well, did you know there is no where in the Bible that tells you it’s wrong to have an abortion?” Oh Boy. Their minds will go “does not compute, does not compute” like Verger on Star Trek? Remember that? Remember that Kirk hit him with some reasoning – this flawed machine; and it started smoking and blew up because it couldn’t handle the logic.. So if you point out to somebody on the right: “Well, it doesn’t say anywhere in the Bible anywhere about abortion, or when life begins or anything. Do you have some revelation from God on it or something? Why do you think you’re right on this?” And they will look on you like you’re their worst enemy on the face of the earth. You are shattering their belief system. On the other hand let’s suppose you are with some people on the Left, and these guys all voted for John Kerry. You say “Well, there’s no real evidence of global warming. All the evidence they have is pretty much fabricated. And they go “WOW where did he come from? – What are you some Bush Zealot?” So they will go on and on and on and will almost attack you and are ready to devour you before you leave the room. So it’s interesting that both sides are vulnerable – if you hit them with something contrary to their belief system – and probably I’ve hit both sides right here contrary to your belief systems because there is probably both conservatives and liberals here. So hopefully nobody here shatters like glass. I think we’ve got a little bit more malleable group here than you would normally have. But this is the interesting thing about truth. There is truth that is perceived because this is what we want, and then there is the truth. There is the way things really are. A lot of people try to confuse the system because they say “Well that’s your truth and I have my truth” OK so you think 2 plus 2 is 5 and I think 2 plus 2 is 4 and your truth is 2 plus 2 is 5. Because that’s your truth does it make it the truth? Or perhaps I think 2 plus 2 is 6 and he thinks 2 plus 2 is 5. Both of us are wrong and we both need an awakening to what reality is. There’s reality and then there’s illusion. Just Like in the days of Columbus many people thought the earth was flat. Because they thought it was flat and it was their truth was it really the truth? No it was their illusion not their truth. There’s your illusion and then there’s truth. The Course in Miracles makes an interesting statement and I’ve talked to very few people who believe the Course in Miracles who believe what the course actually says. And it says this about truth. “The truth is true and nothing else is true.” Now think on that. The truth is true and nothing else is true. 2 plus 2 equals 4. Well let me put it this way – 3 plus 1 equals 4 – right – but 2 plus 2 equals 4 and 2 plus 2 doesn’t equal anything but 4. No matter how many times you try to add it up 2 plus 2 will equal 4. Audience: How do we know society someone back in time didn’t screw up the calendar and its really January 14th? It could be. Yeah, right – that’s true. And whatever it is that’s where it is. We could be a few days off with the calendar but then you’ve got to go back to the starting point of the calendar. But in our reality here it’s a certain time, we are in a certain space and that’s what it is. People say “Well gosh we could just all be dreaming – maybe we’re not really here.” Well, even when you’re dreaming, a dream is still truth. If you dream you’re being chased by a monster it’s still true that you’re dreaming that you’re being chased by a monster. It’s still true that you went through that experience. So whatever experience you’re going through is true and nothing else is true. We are all going through this experience together and we can philosophize about what’s going on around us- what’s causing the experience – if it’s a dream – if it’s all the atoms coming together – if it’s the mind of God making it happen, or whatever is causing it – whatever is causing it that’s what it is. We may not know all the facts. But when we find out the truth, the truth is true and nothing else is true. We’re going through this experience right now, all of us together in this room, having an experience together and this is what is true in this moment in time and space. On another forum this question came up. Suppose a teacher appeared and taught some things that were interesting and could be true. You find them stimulating and want to continue learning from him. Then you find out the guy is a real bad dude. He has lied to you and others many times, has misused people, has an inflated ego, squanders other people’s money etc. In other words, the guy has the faults of a typical cult leader. The question which arises then is this. Do you throw everything you learned from him out the window? Do you dismiss as untrue everything new that comes out of his mouth? Suppose he was Hitler himself reincarnated or Satan born in the flesh. Does this mean one should reject everything he says? One could turn this question around and ask: Suppose you met another teacher of impeccable character and you found out for sure that he had regular visits from divine messengers – or better yet was Christ reincarnated? Are you now to place your powers of discernment on hold and just accept without question everything that comes out of his mouth? I think most of us know the answers to these questions – at least in theory. In the real world though we humans are fairly lazy and are always looking for the easy way out. If we could just find someone with all the answers then we would no longer have to struggle with right or wrong, truth or error on a personal basis. There is a great attraction for many to the guy who will do all their thinking for them. It’s a lot like discovering a government program that pays us not to work. Even though one may have reservations about hopping on the bandwagon most would take the freebies and once the free lunch is relied upon the individual will then defend his situation with all his might and will resist doing hard work again. With our teachers we are like pendulums and swing from one extreme or the other. A teacher is seen by many as being all right or all wrong. For fundamentalists Christians every word in the Bible is true and not to be questioned, but accepted even if it seems to not make sense. Jesus and all the prophets are to be accepted without question. On the other hand, the Koran, the Bhagavad Gita or the Book of Mormon is to be rejected out of hand. Then we witness that the Mormons bypass the filtering process and accept, the Book of Mormon, Joseph Smith and the current prophet without question but will flat out reject any revelation or prophet not connected to the church. This black and white attitude is pervasive and remnants still surface even in true seekers trying to rely on the inner voice. When an outer voice comes along that seems to have all the answers the temptation is great to become lazy and quit doing the hard work of discovering and verifying for oneself and to just sit back and accept the other guy without question. Then we also want a neat littler package of structured beliefs so we can outright dismiss any new doctrine that comes along. The question then is what is the right approach? Suppose you had a change to interview the Satan himself in a safe environment. How should you approach him? Do you automatically assume everything he tells you is a lie? Is it possible you could learn some new truth? According to legend he was once an archangel and had access to all the mysteries of God so he probably knows a lot more truth than any mortal and is smart and cunning. We are told he is a liar so you can’t trust anything he tells you but that doesn’t mean there isn’t truth in many things he would say. They key, of course is to rely on the inner voice and confirmation. If a true seeker listens to this master of deception speak he will register some things as true and some false. If he is able to pick the devil’s brain then he may come up with some interesting pieces of the puzzle of life. Now, if someone introduces you to a teacher and testifies that he is full of light and truth, what should be your approach in judging the truth of his words? Verily, it should be the same as if you were talking to the devil himself. Some of what he says will probably be true and other things no so much. Now merely investigating teachers and attempting to discern the truth of their teachings can be fairly harmless as long as one takes the good and leaves the bad behind. The problem occurs when the person becomes a follower. If he becomes a supporter and gives his time, labor and money to the teacher then he must make sure he is going the right direction. In this case your leader should be a person of virtue. Giving your support is much more serious than just listening and learning. By giving your support you will now further the goals of the teacher and if his goals further the dark side then your efforts could support an enemy of truth. The conclusion that the disciple must arrive at is this. Go ahead and listen to all teachers, philosophers and politicians that you find interesting and use your best judgment to assimilate the good and discard the bad. If you are going to support them, first get inner confirmation to the extent that what you are supporting makes perfect sense to you and you are confident people will benefit from your efforts. If all would do this, the earth would soon become a paradise.